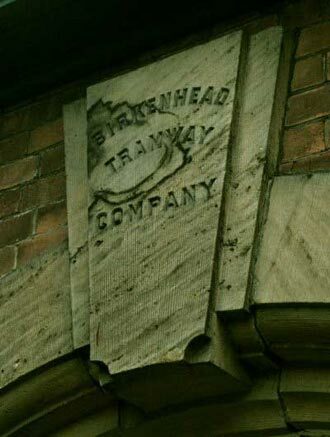 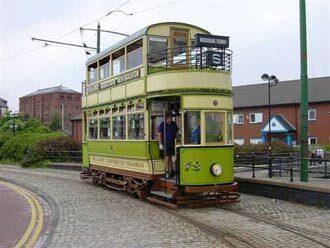 The Keystone from the Birkenhead Tramway Offices has been bought by Wirral museums from the demolition company for £200 and is now at the Taylor Street Museum. 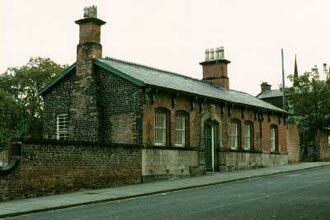 The building was only ever used as Horse Tramway offices - tram tracks ran to the building, horsetrams were stored there with the horses in stables at the rear. 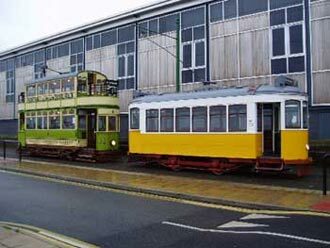 A few years ago we rescued the timber saddle hangers from the stables at the rear of the recently demolished building, these are also at Taylor Street museum. 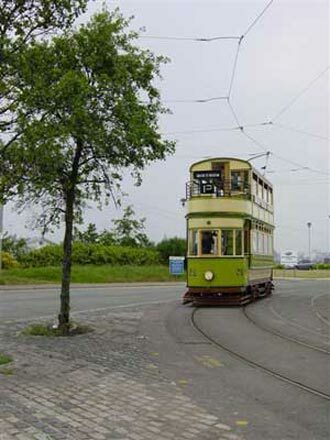 When the horse trams finished the building was never on an electric tramway route. 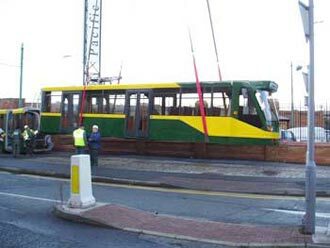 Friday 23rd December 2005 - a depressing tale for Christmas sent in by Charles Roberts. 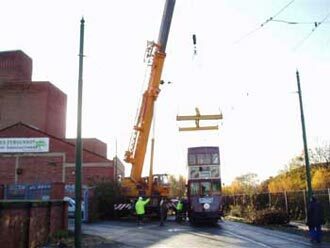 Sunday 18th December 2005 - an uplifting tale for Christmas! 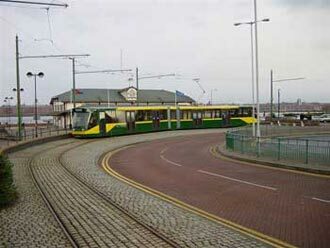 This is not Birkenhead's answer to Blackpool's Starr Gate Turning Circle! 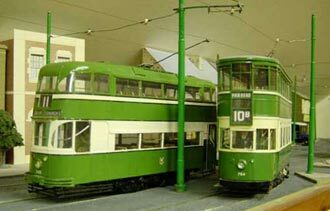 Due to the fact that the Hong Kong cars have only one main staircase at the end of the car, it is essential that the trams are facing Woodside Ferry Terminus the correct way for loading and unloading. 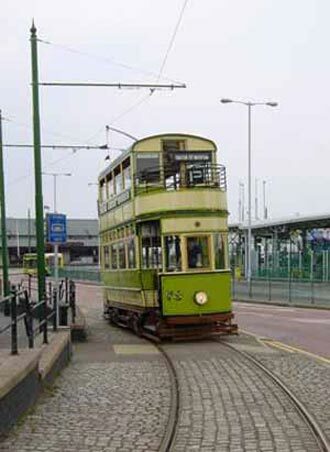 When these trams returned from Blackpool after their trial period, No.69 was placed on the tracks the opposite way around to No.70. 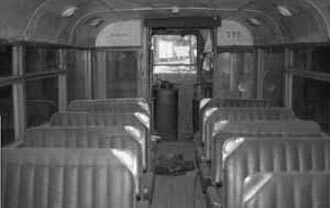 This meant that No.69 saw very little service. 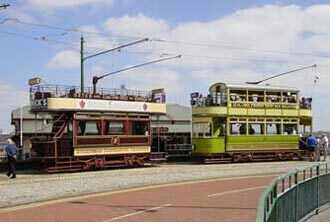 Now that both the Hong Kong sisters are the correct way around they can sing along the wires together. 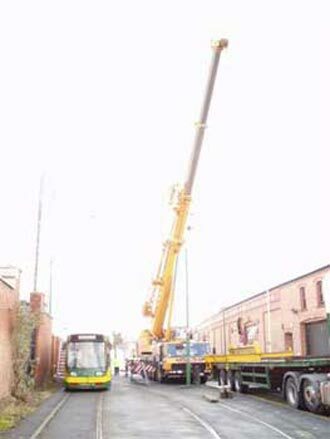 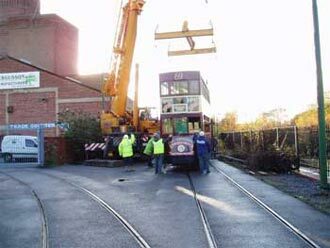 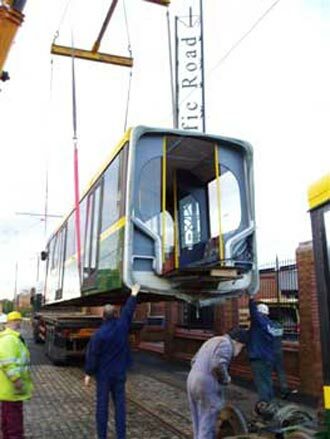 We would like to thank TRAM POWER who paid the full cost of the crane, used for turning Hong Kong Tram No69 around. 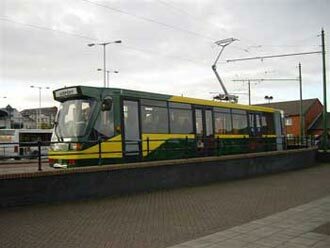 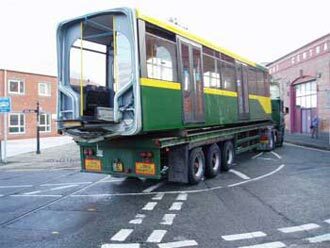 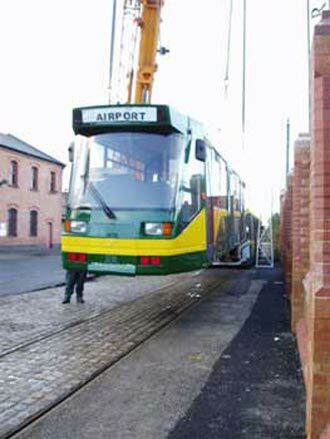 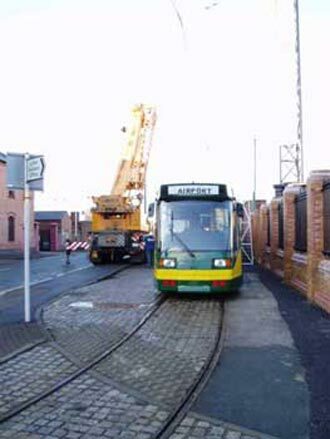 Sunday 27th November 2005 - CITYTRAM in action on Heritage Tramway. 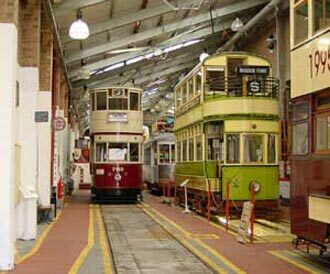 Wallasey 78 features in Heritage Lottery Event. 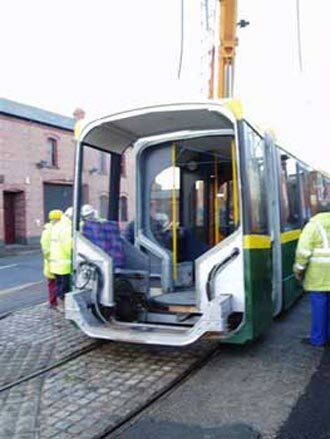 Prof. Lewis Leslie's City Tram on Test. 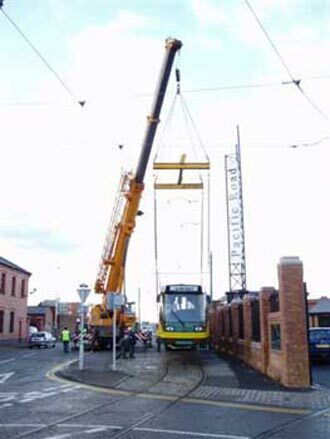 So that's how it's done! 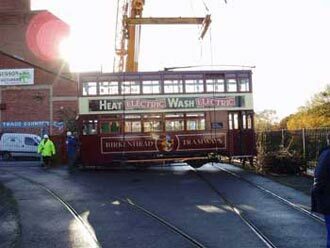 Terry Martin puts the finishing touches to the lining out on Birkenhead 70. 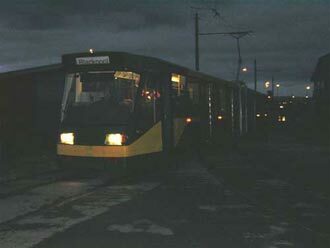 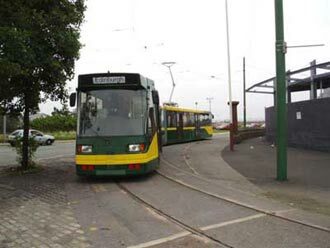 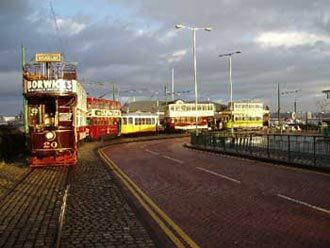 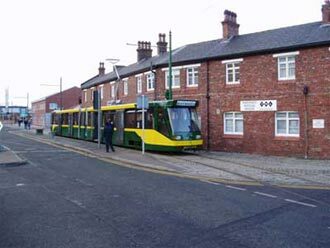 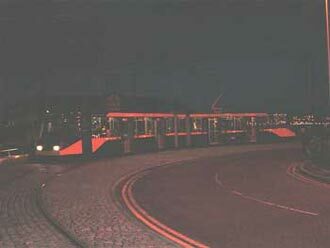 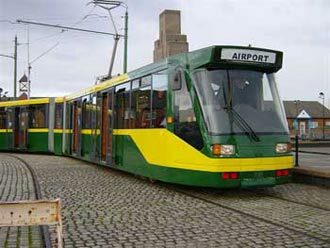 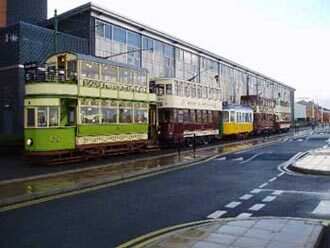 Sunday 31st July 2005 - FOUR TRAMS IN SERVICE! 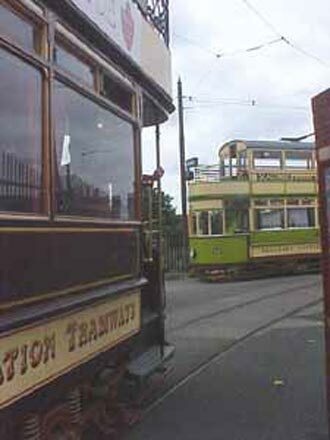 Sunday 31st July was the day chosen to try four trams in operation. 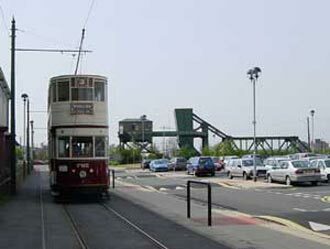 One car would stand at each end (discharging/loading) while two cars would be en route. 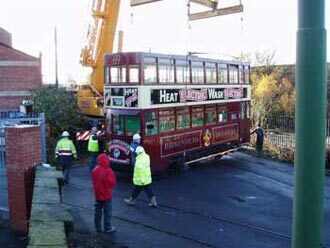 When we joined the proceedings, Liverpool 762 had just left Taylor St. leaving Birkenhead 70 (looking so much better in traditional livery) as the next car out. 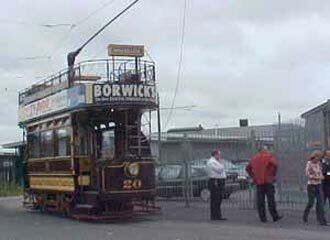 Presently Birkenhead 20 arrives driven by Keith Carmichael and swings into the depot connection to unload passengers. 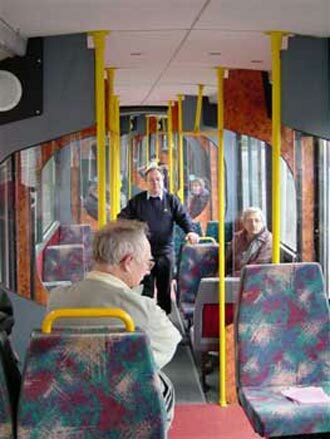 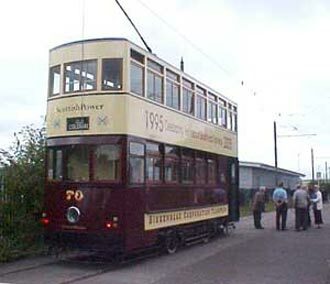 The departure of 70 is soon followed by the arrival of Wallasey 78. 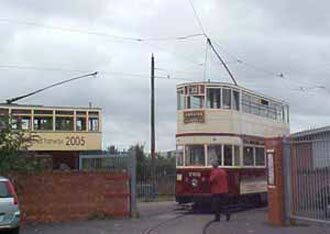 We are travelling on 20 and approaching the passing loop at Pacific Rd where 762 awaits our arrival. 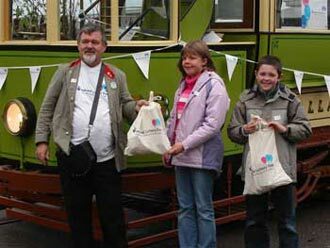 An intensive service requires a good turnout of volunteers and staff. 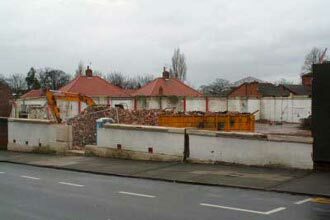 All credit to those that took part. 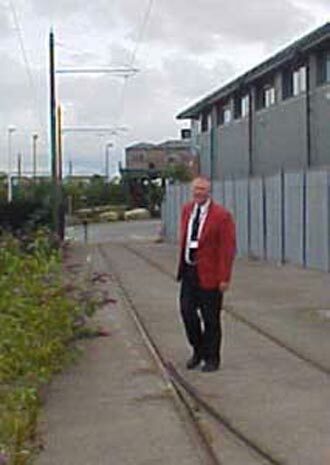 Here Geoff Martin goes to change the points ready for the departure of 20. 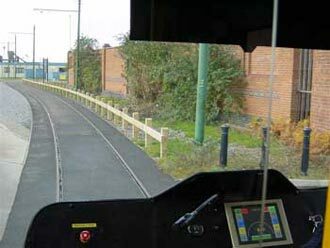 70 stands at Woodside as we pull in on the adjacent siding. 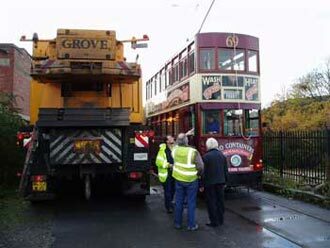 70 has left and been replaced by 78 with driver Mike Mercer (in blue shirt) as we leave Woodside. 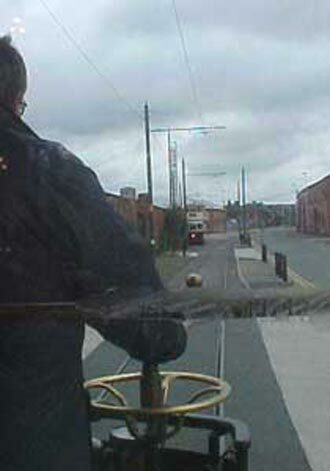 Yes, Keith did stop for him, but takes five on arrival at Old Colonial, leaving Martin to recover and Geoff shaking his head. 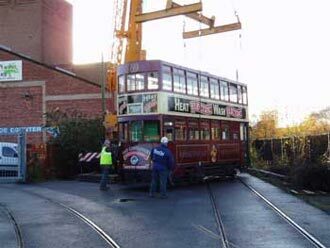 However Geoff is soon back in action as 762 departs later. 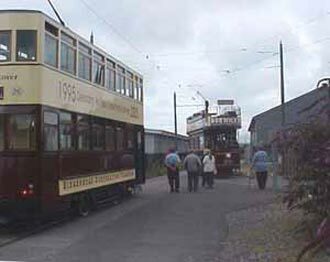 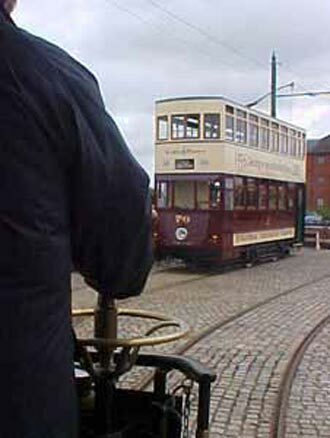 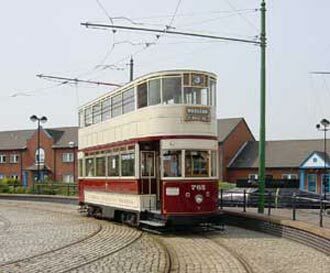 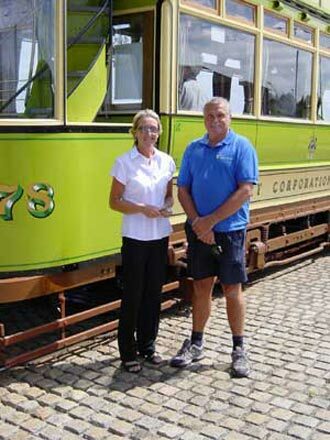 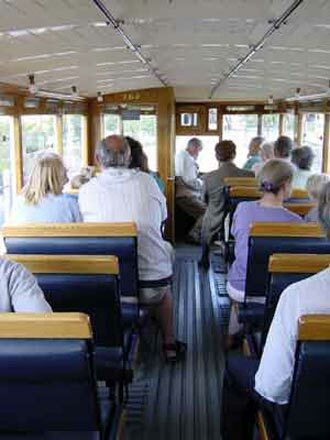 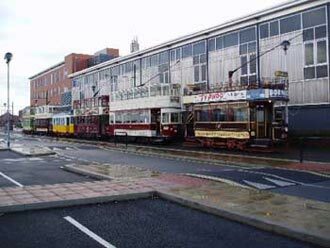 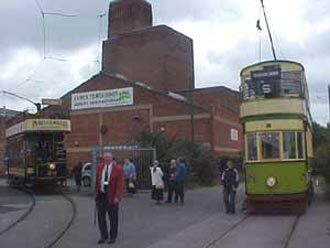 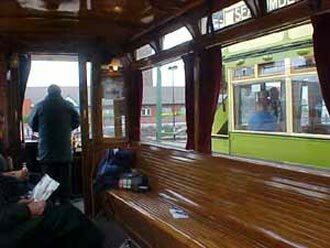 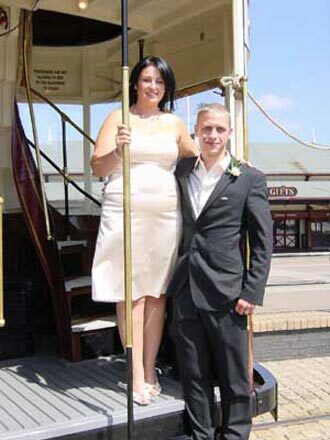 After ten years of the Heritage Tramway operating in Birkenhead, Mike and Wendy Mercer became the first man and wife team to crew one of the tramcars. 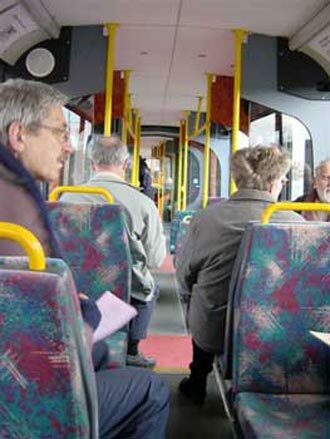 Another first of the day. 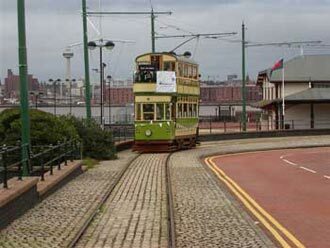 Service car Birkenhead 20 due out in 5 minutes while Wallasey 78 is taking on a private party of day visitors from North Wales. 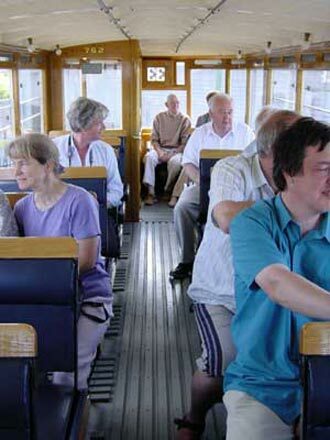 Liverpool 762 with passengers enjoying a sunny afternoon on Merseyside. 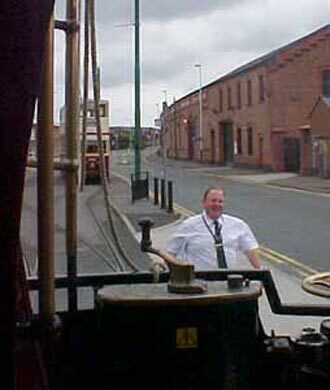 "You certainly may post these photos on your website. 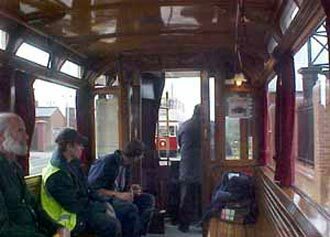 The photos are a few years old, but the car essentially stays the same under cover. 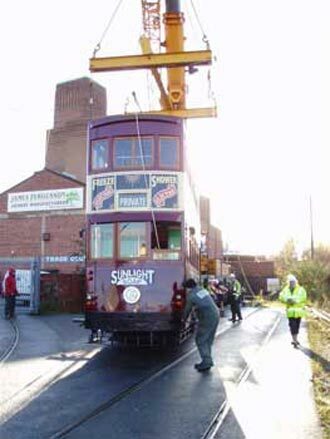 I remember when it arrived from England as bright as a new penny. 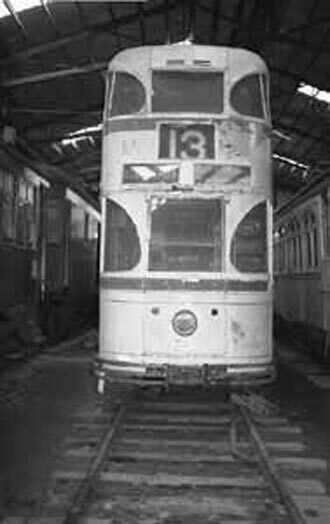 People forget that 48 years have passed and 293 has spent more time in a museum setting than on the streets of Liverpool. 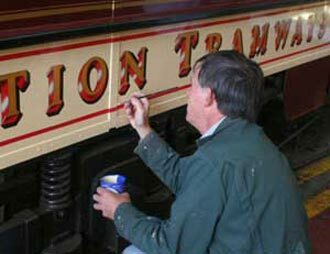 I often wonder if a coat of paint would do a lot to assuage the feelings of UK enthusiasts. 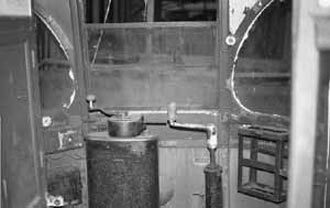 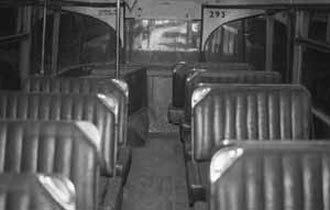 Like the Feltham, the wiring in the car needs replacement, but structurally, it seems to be in fairly good shape. 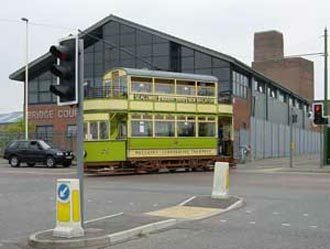 To its credit, Seashore has taken derelict cars and made them like new again. 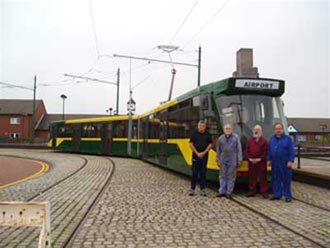 All they need is money and talent. 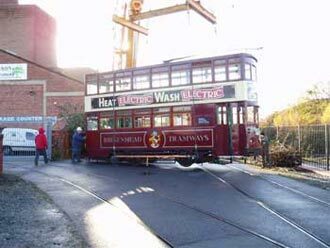 I suspect that any tram skilled UK guy that wanted to spend a few weeks in Maine looking after 293 would be welcomed with open arms. 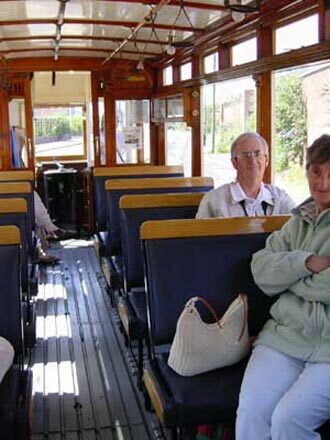 Dont forget the money!"